Florence St. John was born in Brooklyn, New York. After moving to Georgia, she graduated from Kennesaw State University with a Bachelor’s Degree. She now lives in Florida. Other books include, Entangled with a Sociopath and Borderline, the Illusion of Insanity. Entangled: With a Sociopath by Florence St. John is a non-fiction book that explores the psychology of a sociopath and one woman’s journey through abuse and manipulation in an unhealthy relationship. Florence has given her heart, her money, and her life to Daniel, the man who swept her off her feet and convinced her to float away with him and leave their problems behind. Everyone had warned her about investing $10,000 in a boat, but Daniel had sweet talked her into buying into the idea. What looked like a beautiful dream soon becomes a terrible nightmare. Florence no longer has control of her life. The high school friend who contacted her, the man whose charm won over her heart, is actually a sociopath. Can she regain her freedom? This is the question the reader wants answered. This is an intelligently written memoir that helps readers understand the psychology of a sociopath. I felt that it was one of the best portraits of a sociopath I have read after Thomas Harris’ novels. 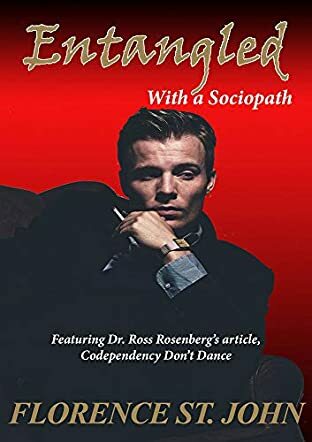 From the very beginning, the author offers readers powerful insights into the personality of a sociopath: “The sociopath’s most deadly weapon is the charm offensive – but beware… it’s superficial charm and lacks an atom of sincerity. Sociopaths are accomplished actors. Smooth, engaging, charming, flattering, a sociopath will never be tongue-tied or embarrassed.” She takes readers on an emotional ride that unveils the pain of being in an abusive relationship. The story is told from a first person narrative perspective that is utterly absorbing. Florence’s prose is exquisite, the tone powerful and irresistible, and the events well constructed to keep the reader moving from page to page. Entangled: With a Sociopath is spellbinding, a memoir that entertains and that creates a strong awareness of the subtle ways sociopaths can take complete control of a relationship. Florence St. John has a lot to offer the world through her honest and unfiltered narrative.